SPJ’s long weekend in tropical Orlando – EIJ15 – came to a close on Sept. 21 with the meeting of the new officers and board of directors. Executive Committee. Bill McCloskey and Joe Radske were the directors elected to the executive committee. SDX Board. Seven people were appointed and ratified as SPJ’s reps to the Sigma Delta Chi foundation board of directors: Paul Fletcher, Lynn Walsh, Rebecca Baker, Dana Neuts, Sue Kopen-Katcef, Bill McCloskey and Patti Newberry. SDX Officers. The board ratified the election of new SDX foundation board officers to one-year terms: Irwin Gratz, vice president; Hagit Limor, secretary; and Howard Dubin, treasurer. SDX board president Robert Leger is in the middle of a two-year term. Finance Committee. Bill McCloskey and Eddye Gallagher will continue to serve on the SPJ Finance Committee. A New Community. The Community Journalists Community was approved and becomes SPJ’s sixth community. Al Cross will lead the new group. Gaming Awards Proposal. Michael Koretzky proposed that SPJ provide, on a one-year, experimental basis, a series of gaming journalism awards. Michael will work with and through the Awards committee, chaired by Andy Schotz, in developing his proposal. Wells Key Selection. The officers voluntarily adopted the Wells Key selection process that was to begin in 2016, with the full Executive Committee making the pick instead of only the officers. Sue Porter was this year’s honoree. Governance meetings. A motion to provide notice of governance meetings, such as board meetings, both in print and convention signage passed unanimously. A request to put resolutions likely to spark discussion and debate will be heard first next year, ahead of congratulatory resolutions and others likely to pass in a block. President-elect Lynn Walsh will serve as SPJ’s point person in development of EIJ16 programming and will coordinate with Scott Leadingham and the team deciding programs for next year. ACEJMC. Steve Geimann served for many years as SPJ’s rep on the Accrediting Council on Education in Journalism and Mass Communications. The 2015 convention passed a resolution directing the board to continue to support an SPJ rep on ACEJMC by paying his/her dues and expenses to attend two meetings. Sonny Albarado has agreed to serve as our rep.
Director Elections. With Rebecca Baker’s election to Secretary-Treasurer, the Region 1 director seat is now open. SPJ HQ will begin publicizing the opening and solicit candidates; we will hold a board call in October to name an RD for that region. We will be following the same procedure for Region 7 after the turn of the year; Rob McLean has moved to New York and will serve until February. The Executive Committee approved minutes from its January 31 meeting in Orlando. I gave updates to the president’s report. Board member Mike Reilley has agreed to lead a group of volunteers to provide staff with guidance for delegate training materials. I am working with the International Community to help with the leadership transition. Also, I met with Sonya Ross of the Associated Press on Friday. We discussed a number of possible partnerships on additional diversity initiatives. SDX President Robert Leger provided us with an update on foundation business. The Executive Committee approved the investment policy for the advocacy fund. President-elect Paul Fletcher gave an update on the non-affiliated member representation task force. The group has had several calls. The next step is to send a survey to SPJ members who are not affiliated with a chapter. Secretary-treasurer Lynn Walsh gave an update on a supporting membership program which would give non-members an opportunity to support SPJ’s mission. She has created a work group who has met by phone once already. She asked us to submit questions on what we’d want to know about such a program if we decide to create this support tier. The Executive Committee approved a policy regarding the hiring and firing of the executive director. The policy will help protect SDX’s interests because the executive director will oversee more of the SDX operations with the shift in education and programming responsibilities from SPJ to SDX. Membership strategist Tara Puckey provided a technology update. She and Billy O’Keefe went to Chicago last week for training. The behind-the-scenes work is still taking place, so changes won’t be outwardly noticeable for a while. Executive Director Joe Skeel gave us an update on strategic partnership updates and how these partnerships impact staff. He gets regular inquiries and requests for proposals on SPJ’s administrative and “back office” support services. Joe also provided us with an update on EIJ18 and possible conference sites. One possible site in Baltimore is already booked for the time period we are considering, but it has offered us a proposal for EIJ19. The Executive Committee entered executive session to select this year’s award winners in the following categories: D. L. Eshelman Outstanding Campus Adviser, Distinguished Teaching, Ethics, Historic Site, Howard S. Dubin Outstanding Pro Members, Julie Galvan Outstanding Graduate, Regional Director of the Year, Sunshine Awards, and the Wells Memorial Key. If you have any questions about the meeting, please let me know. For copies of reports, meeting materials and a replay of the meeting’s live stream, click here. The board approved the Fiscal Year 2016 budget. To executive director Joe Skeel’s credit, SPJ has a sizable surplus. We are operating in the black and expect to continue to do so with sufficient reserves set aside for a rainy day and to spend on worthy projects. The slate of candidates for the next SPJ board cycle was announced. New candidates have until about a week before EIJ15 to announce their candidacy. So far, there are only two contested elections (secretary-treasurer and at-large director). Interested candidates should contact Sonny Albarado, past president of SPJ and this year’s nominations chair, or click here for more info. We are seeking nominations to replace regional director Tony Hernandez (Region 12). He moved out of the region, and we are looking for a replacement, effective June 1. We also thanked Tony for his service to SPJ. SDX President Robert Leger gave an update on the SDX Foundation, including the transition of moving programming responsibilities and funding from SPJ back to SDX. The Ethics Committee, led by Andrew Seaman, is beginning the posting of additional materials to supplement the revised SPJ Code of Ethics that was approved by the delegates at EIJ14. In addition, the Code has been translated into five languages (French, Spanish, German, Chinese and Arabic). Those versions are being proofread and, once approved, they’ll be posted to SPJ.org. The board discussed how to handle the proposed Marriage & Conscience Act now in committee in Louisiana. The board will send a letter to the Louisiana legislature citing its concern about the bill which addresses religious and moral beliefs, unlike other religious freedom legislation being considered in other states. Our hope is that the bill will be defeated. If not, SPJ will have to reconsider hosting its 2016 spring board meeting, and SPJ and its partner RTDNA will have to discuss the implications for EIJ16, both scheduled for New Orleans next year. President-elect Paul Fletcher and secretary-treasurer Lynn Walsh will work on the letter to the legislature and share it with the board for input by the end of this month. We will also share it with RTDNA, and they will vote on whether or not they wish to sign the letter as well. The SPJ board gave staff the go-ahead to expand its criteria for the selection of convention cities. I announced two new diversity initiatives: (1) Adding members of other journalism organizations (e.g., AAJA, NAJA, NLGJA, NABJ, NAHJ, etc.) to the Diversity Committee, led by April Bethea, as a pilot project. If this is successful, we hope to expand this to include members of these organizations on other committees to help expand the diversity within our organization. (2) Creating a partnership between the Diversity Committee and Membership Committee to develop diversity-related resources for our members. We’ll first create a list of programming ideas, gathering successful program information from SPJ chapters and regions. We’ll expand to include other resources such as how to identify local chapters of other organizations that we could partner with, and link to other diversity-related resources, such as the NLGJA style guide and the diversity style guide project that is supported by the SDX Foundation. I announced the Membership Committee’s upcoming promotion, #spj4all, a one-day campaign to reiterate our organization’s acceptance of journalists from all backgrounds. The committee, led by Robyn Sekula, will share details soon. Four new chapters were added to SPJ ranks. Secretary-treasurer Lynn Walsh announced SPJ’s new career center, a dramatically improved version of our job bank which includes links to additional resources. At the request of FOI chair and immediate past president Dave Cuillier, the SPJ board approved a $30,000 transfer from our fiscal year end reserves to the Advocacy Fund. The board discussed how money would be spent and what the approval process might be. Regional director Tom Johnson received the board’s endorsement of his “It’s the People’s Data” project. At-large director Bill McCloskey presented a new SPJ Convention Voting Transparency Policy, developed by the By-laws Committee. The policy was approved. Jennifer Royer, communications strategist, and I discussed the proposed guidelines for handling the deaths of prominent journalists and international matters. Each will be handled on a case-by-case basis, and will rely on good judgment. In Becky Tallent’s absence, an update about the release of the Journalism Education Committee’s new book, “Still Captive? History, Law and the Teaching of High School Journalism,” was shared in the board packet and via email. President-elect Paul Fletcher informed the board that 41% of our membership is not affiliated with a chapter, meaning they are not represented by delegates at convention. At my request, Paul has formed a task force to explore the ramifications of this problem and to make recommendations for correcting it. The SPJ board accepted the Executive Committee’s recommendations for 9 of the 10 overall SPJ awards, as outlined in the board packet. Changes will be effective in 2016. The SPJ board discussed the selection of future Wells Key winners. The Executive Committee recommended that the selection group be expanded from the SPJ officers to the full Executive Committee. This recommendation was approved with two amendments – providing the full board with a list of nominees for the current year and the previous nine years (info. to be kept confidential and not shared outside the board), and after the Wells Key is awarded, the Executive Committee will explain to the board why that candidate was selected. These changes will also be effective 2016. The board meeting was packed full of agenda items, and we had good, thoughtful, respectful discussion and debate about these topics and others. In addition, I thanked the board, volunteers and staff for their hard work and continued commitment to SPJ. We’ve accomplished a lot in the seven months I’ve been president, but there is much more to do. If you have any questions about the meeting, or you’d like to volunteer, I welcome your comments and ideas. You can reach me via email at dneuts@spj.org. 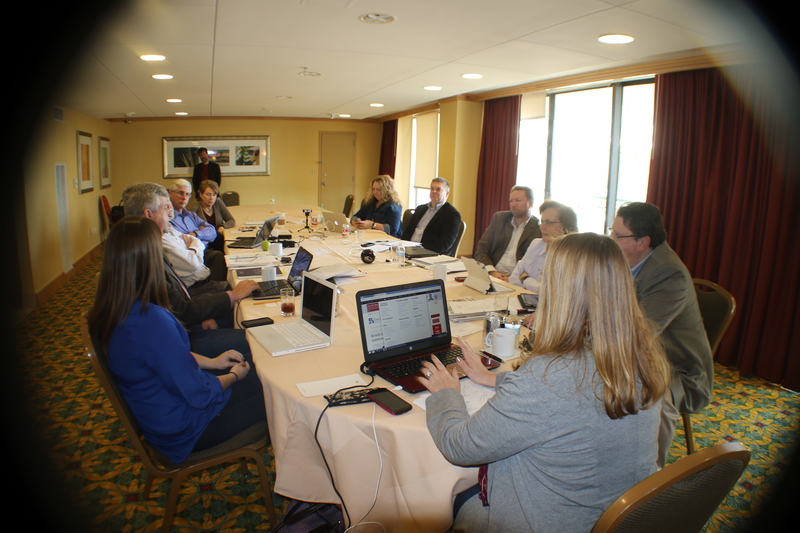 On Sat., Jan. 31, SPJ’s Executive Committee met in Orlando, Florida, the site of the 2015 Excellence in Journalism Conference, co-hosted by SPJ, RTDNA and NAHJ. SDX grant requests: Three grant requests were submitted for the executive committee’s review. We voted to approve the requests, which will now go to the SDX grants committee and then to the full SDX board for a vote in April. International statements: We will handle international journalism incidents on a case-by-case basis. Online Legal Defense Fund (LDF) auction: The executive committee directed executive director Joe Skeel to explore the possibility of adding an online auction component to our annual silent and live LDF fundraisers. Skeel will report to the full board in April. Job bank recommendations: The executive committee directed Joe Skeel to contact our job banks vendor to discuss supplementing our current offerings. Awards and honors: The executive committee discussed recommendations submitted by Lynn Walsh, Sue Kopen Katcef and Andy Schotz for changes to our current awards nomination and selection processes. Some recommendations were accepted; some were not. All recommendations will be submitted to the full board in April for a vote. Any approved changes will be effective for the 2016 awards season. Of note was the discussion of the Wells Key award. The executive committee will recommend to the full board that the entire executive committee select the winner, rather than just the officers. Membership representation: Paul Fletcher reported that 41 percent of SPJ’s members are not affiliated with a chapter, meaning they do not have delegate representation at convention. I appointed a task force to be chaired by Fletcher to do additional research and to prepare a report for the April board meeting. Delegate update: Bill McCloskey will work with others to discuss delegate votes at convention and make recommendations to the board at its April meeting for any improvements or changes that should be made. Tech upgrade: HQ staff is working on data clean-up to prepare for the tech upgrade which will begin after the awards entry season concludes. Strategic communications update: I gave a report on our progress since hiring Jennifer Royer as our communications strategist last August. We have been able to improve our communications, develop processes and procedures, and become more proactive planning events like Sunshine Week and Ethics Week. Fellow of the Society: We adjourned to executive session to discuss nominees for the Fellow of the Society award. We will take two more weeks to consider nominees before making a decision. Joint SPJ & RTDNA meeting: RTDNA chair Amy Tardif and I held a joint meeting of the organizations’ executive meetings to discuss diversity, EIJ programming, partnership opportunities, etc. For board meeting materials and a link to the meeting video, visit http://spj.org/board-meeting.asp. Please contact me if you have any questions. Thank you. Community elections for SPJ Digital & Freelance were launched. Details here. SPJ Georgia attended two separate hearings of Atlanta journalists who were arrested last week during the Ferguson protest. Charges have been dropped in both cases. Reps from SPJ Georgia plan to attend a roundtable discussion tomorrow with Atlanta PD. Thanks to SPJ Georgia for staying on top of this issue and keeping us informed! Alex Veeneman was named our first community coordinator to help me manage the workload. Thank you, Alex, for stepping up! Alex is the current leader of SPJ Digital, so he knows first hand the work involved in setting up a community and keeping it going. The Ethics and International Committees are working together to get the Code of Ethics translated into other languages. I had a call with national board members Patti Newberry, Sue Kopen Katcef, Brett Hall and Jordan Gass Poore last week to discuss student internships and the formation of a student-based community. Brett and Jordan agreed to lead the community and Patti & Sue agreed to serve as advisors. I need to get some input from our legal counsel since some of the internship issues we are discussing involve labor laws. I have selected SPJ’s EIJ15 programming committee volunteer – Athima Chansanchai (“Tima”) from the W. Washington Pro chapter. Tima was a diversity fellow this year and has helped with programming for the AAJA national convention several years ago. She will oversee the programming subcommittee that includes Paul Fletcher, Lynn Walsh and Patti Newberry. Amy Tardif of RTDNA scheduled a pre-planning EIJ15 programming conference call for early January to discuss EIJ14 successes, areas for improvement and goals for EIJ15. Scott Leadingham, director of education, is scheduling his first EIJ15 planning call before the holidays. We updated our statement speaking against Ohio legislation HB663, the secret executions bill, which went before the Ohio Senate Tuesday and today. Past president Kevin Smith attended on SPJ’s behalf. SPJ Freelance Chair Michael Fitzgerald and I spoke regarding the Freelance Community to discuss the election process. SPJ hosted a Digital Tools webinar taught by Kim Bui. SPJ has made an agreement to provide services to another journalism organization and has put a call out to hire a part-time communications person to help with that work. SDX did a big fundraising push this week, including a mailing and an email campaign. SPJ members are encouraged to set up monthly donations or make a one-time donation to help fund SDX’s efforts. Donate here. New member benefits are forthcoming. Linda Hall has been working hard to develop new relationships and acquire new benefits for our members. SPJ HQ will announce those new benefits soon, so stay tuned! We are trying to finalize all of the spring conferences. Some dates and locations are still tentative. The info. that is known can be found here. Joe hired a replacement for the part-time membership retention coordinator. We are eager to welcome him aboard! Tara Puckey was promoted to membership strategist to help further SPJ’s long-term mission and to address our changing membership needs. Linda Hall will continue to provide our members with the great service she always has. Congrats to Tara for this well-deserved promotion! FOIA chair Dave Cuillier issued a statement urging the U.S. Senate to pass the FOIA Improvement Act. SPJ tweeted this tonight. Senator Jay Rockefeller has put a hold on the bill. Butler Cain, J Ed committee chair, held a meeting with his committee yesterday to discuss providing resources, guidance and a list of experts to help support high school journalists and educators. Robyn Sekula, membership chair, is accepting nominations for the December Volunteer of the Month (deadline is tomorrow) and finalizing the committee’s strategic plan for the year. Carlos Restrepo and the International Journalism Community are also finalizing their goals for the year and selecting their assignments and projects. We have an enthusiastic bunch here – I am excited to see them move forward! Sarah Bauer, contest advisory group coordinator and co-chair of the Awards & Honors committee, is in the process of matching up SPJ contest swap partners across the country. This is a thankless task, but an important one. Thanks to Sarah for taking the lead! Thanks to everyone within SPJ and SDX – staff, leaders and volunteers – who have contributed in some way to our success and mission. It truly takes a village, and we’ve got some big goals to tackle this year. I appreciate your enthusiasm and support. As always, if I left something out, it was unintentional. My head is spinning with all of the activity, but if I omitted something, let me know, and I’ll update this post. Earlier this week, we lost journalism legend Ben Bradlee of The Washington Post. He inspired an entire generation of journalists and took editing to a new level. He will be missed. Here is a nice piece in The Washington Post remembering his contributions. SPJ Georgia and regional director Michael Koretzky fought for and supported George Chidi, a freelance journalist in Georgia, after Thomas Owens, a candidate for DeKalb County commissioner, sought a temporary protective order and filed an application for a warrant on stalking charges against the journalist. The protective order and application were both dismissed, upholding the First Amendment and helping to protect Chidi’s right to do his job. Thanks to SPJ Georgia and Koretzky for fighting on Chidi’s behalf. SPJ, the Student Press Law Center and 18 other organizations sent a letter to education leaders to renounce the actions of the Neshaminy School District in Bucks County, Pennsylvania for punishing student journalists and their adviser for refusing to use the term “redskins” in the Playwickian, a school publication. Principal Rob McGee suspended the journalism adviser for two days without pay, removed the Playwickian editor from her position for a month, and the newspaper was fined $1,200, the cost of the June edition which omitted the Native American mascot name. The membership committee, led by Robyn Sekula, is working on a master plan to outline its goals and strategies for the coming year. The committee also named its October Volunteer of the Month – Lee Anne Peck of the University of Northern Colorado. Congratulations, Lee Anne! The SPJ international journalism community, led by Carlos Restrepo, is also working on a master plan, breaking its work into three primary goals and subcommittees. More on that once the community has had time to review and comment on it. The journalism education committee is publishing a book in January titled “Still Captive? History, Law and the Teaching of High School Journalism.” The project is the result of three years of research and a survey of nearly 250 Journalism Education Association members in 47 states. The ethics committee continues to be busy, educating others on the revised Code of Ethics, preparing supplemental materials for SPJ.org and speaking on ethical issues. Check out this post from ethics chair Andrew Seaman on the ethical reporting of Ebola. The awards and honors committee, led by Andy Schotz, has been working with Abbi Martzall, SPJ’s awards coordinator, to review our awards criteria and make recommendations for changes. Sarah Bauer, the committee’s co-chair, is coordinating the swaps for local and regional SPJ chapter contests. If she hasn’t already, she’ll be contacting awards coordinators in the near future to plan for swaps for next year’s contest season. The Generation J committee, led by Claudia Amezcua, has been working with her committee on its plan for the year and will be working with secretary-treasurer Lynn Walsh and past president John Ensslin on the recommendations made by the futures task force in June. Two goals for Gen J this year are to broaden the committee’s mission to include journalists at all career levels and to partner with other committees to offer training opportunities via joint Google hangouts. Led by SPJ past president David Cuillier, the FOI committee has been hard at work, developing a blogging and tweeting strategy for the committee to handling breaking FOI news and to be proactive on FOI issues. For FOI resources, check out the FOI page on SPJ.org. At SPJ headquarters, staff has been busy on many fronts, including planning for EIJ15 (yes, already! ), sending out new ethics posters and bookmarks, working on affinity partnerships to offer additional benefits to our members, and developing communications strategies for how and when to communicate with the public and other media organizations. Recently, I had the opportunity to travel to Phoenix on behalf of SPJ where I talked to ASU journalism students about how to get started freelancing and get those first critical clips. I also met with SDX president Robert Leger and had a fun evening with SPJ members of the Valley of the Sun Pro chapter where we celebrated some local journalism and PR successes and talked about what’s next for SPJ in the year ahead. I’ve also been working with communications staff at HQ to create an outreach plan to help promote our communities. Up next: a visit to Peninsula College in Port Angeles, Washington, finding a volunteer to help support our communities, and planning our January executive committee meeting. I am sure I have omitted a letter SPJ signed onto or committee projects and, if so, I apologize. The omission is unintentional, but email me so I can include it next time. As always, thanks for your support of SPJ. If you have questions, concerns or ideas, you can email me at SPJDANA @ GMAIL.COM. Launch of International Journalism Community: Under the leadership of Carlos Restrepo of the St. Louis Pro chapter, the International Journalism Community was launched. To date, more than 30 journalists have expressed an interest in joining the community. Want to get involved? Email Carlos directly. Volunteer of the Month: Last week, the Membership Committee named its volunteer of the month – Victor Hernandez of CNN, for overseeing Excellence in Journalism news at EIJ14. Guiding a team of 14 student interns, Hernandez selflessly shared his expertise. Thank you, Victor! Journalism Education Committee: Butler Cain, assistant professor of West Texas A&M, and the Journalism Education committee are getting the year off to a good start, wrapping up the editing of a book on the state of high school journalism. I anticipate lots of great work coming out of that committee this year, so stay tuned! Diversity Committee: Lead by chair April Bethea, the Diversity Committee has gotten off to an enthusiastic start. Read April’s blog post about the committee’s goals for the year. Ethics Committee: Committee chair Andrew Seaman and SPJ communications strategist Jennifer Royer are working on a plan to publish, publicize and share the revised Code of Ethics. Late last week the final version went to the printers. Posters and bookmarks will be available soon. Journalism Advocacy: SPJ issued a statement applauding the city of Tupelo, Mississippi for complying with open records laws. Though the laws have been in place since 1983, Tupelo is the first municipality in Mississippi to comply. Thanks to SPJ member and reporter Robbie Ward, staff writer for The Northeast Mississippi Daily Journal, for prodding the city to archive text messages and make them available to the public. Journalism Advocacy: SPJ signed onto a letter by the American Association of Law Libraries to the Administrative Office of the U.S. Court urging them to restore electronic access to court records that were recently removed from PACER and a letter from the Reporters Committee to the DOJ for a dialogue following the media’s treatment in Ferguson. Volunteer Outreach: Since EIJ14, I’ve been making calls to volunteers including new board members, committee chairs and community leaders to learn about their goals for the year and to thank them for their service. In addition, I have asked for a volunteer to help me support SPJ’s communities, including freelance, digital and international journalism. If you have an interest in working with me, please email me. Board Training: Chapter coordinator Tara Puckey held the first of two sessions of board training via Skype to tell us more about our roles and responsibilities. I’m traveling this weekend to meet with the Fort Worth Pro SPJ chapter for its annual “welcome the president” event. I will update you on this week’s highlights when I get back. Until then, thanks for your support of SPJ and journalism, and let me know how I can help.